Our guide to San Jose will help you find the best kid friendly parks in San Jose California. To many the South Bay is synonymous with Silicon Valley, the center of high-tech research and the corporate headquarters of such giants as Apple, Sun Microsystems, Oracle, and Hewlett-Packard. But Silicon Valley is more a state of mind than a place -- it's an attitude held by the legions of software engineers, programmers, and computerphiles who call the area home. That home is becoming increasingly visitor-friendly; within the sprawl are appealing towns whose histories stretch back centuries, a thriving arts scene, and shops and restaurants to satisfy the most discerning tastes. There are tons of great kid friendly parks in the city of San Jose, our city guide will help you find the best kid friendly parks. You may have a hard time deciding what to do in San Jose, but we make your decision easy. Blossom Hill Rd & Hillview Ave, (415) 947-0585 - A simple little playground located outside a large shopping mall in San Jose. Perfect for when your child has shopping overload. Castle Glen Ave & Regency Dr - A large well equiped neighborhood park in San Jose, Ca. Chynoweth Ave & Chynoweth Park Ct, (408) 226-3200 - A cute little neighborhood surrounded by a grassy field. E St John St & N 3rd St, (408) 279-1775 - An unusual playground in a large park in downtown San Jose, Ca. Forsum Rd & Forsum Ct - A tiny little playground with two swings, two plastic spring animals, and a very low-key play structure. Glenburry Way & Stardust Ln - A small neighborhood park in San Jose, Ca. Groesbeck Hill Park & Million Ct - This park has a nice little playground for the younger kids and just up the hill is a climbing intensive structure for the bigger kids. Hermocilla Way & S King Rd - This park features something for everyone from par courses to playgrounds. Hillsdale Ave & Cherry Ave - Paul Moore Park is a kid friendly park located in San Jose CA. Hoyet Dr & Cordelia Ave - A really nice little playground in a narrow strip park that runs for several miles bordered by a soundwall on one side and houses on the other. Knox Ave & Story Rd, (408) 926-5555 - A nice, high payground in Emma Prusch Farm Park. The playground has swings, slides and a lot of climbing space. Meridian Ave & Camden Ave - A nice park sitting on a small hill equiped with clean and modern equipment. Millbrook Dr & Remington Way, (408) 535-3570 - A large playground in the Boggini neighborhood park. This park (and playground) is frequented alot on weekends. 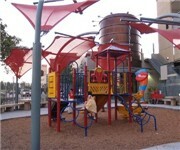 Mitty Way & Park Meadow Dr - A modern neighborhood park with a nice plastic/metal play structure. Morrill Ave & Cataldi Dr - A good sized park in San Jose with play structures and a rock climbing wall. Oakwood Ave & Camden Ave, (408) 279-4009 - This playground in Butcher Park is for children between the ages of 5 and 12. It's one of two playground on site. Pearlwood Way & Cahalan Ave - A nice neighborhood park with a variety of equipment for the different age groups. Piazza Di Valencia & Olin Ave, (408) 551-0010 - Located in the midst of a large upscale open air shopping center is this small play area designed for ages 2-5. Princeton Dr & Marquette Dr, (408) 271-8841 - Two colorful playground in De Anza Park in San Jose, CA. Radio Ave & Curtner Ave, (408) 269-3356 - A neighborhood park that was renovated in 2002 to turn it into a great place to play with equipment for all ages. Rainbow Dr & Johnson Ave - A cute neighborhood park located near a school in San Jose, Ca. Roy Ave & Spadafore Ave - A cute little pirate themed neighborhood playground in San Jose. No swings here, but a nice pirate ship takes up the play area. Ryland Park Dr & Ryland Park Wy, (408) 298-7657 - Ryland Park has a childrens playground with a train layout theme. There are plenty more kid friendly parks in San Jose. See all kid friendly parks in San Jose California.